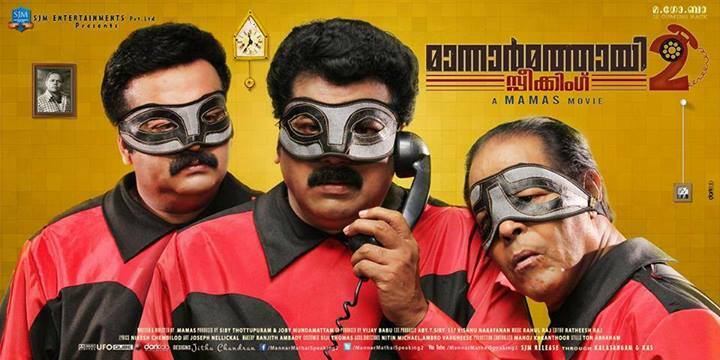 Mannar Mathai, Balakrishnan and Gopalakrishnan Is Coming back to entertain the Malayalee Audience. Mannar Mathai Speaking 2 is Releasing Today, 24th January 2014. Its the Sequel to Siddique-Lal’s Ramji Rao Speaking and Mannar Mathai Speaking. Ramji Rao Speaking Released in the Year 1989 and Mannar Mathai Speaking On 1995. These two films are as cult comedy classics. Siddique-Lal Started Their Directorial Debut With Ramji Rao Speaking. That was a Block Buster Movie. Innocent is Playing the Title Role of Mannar Mathai. Mukesh is Playing the role of Gopalakrishnan and Saikumar is Balakrishnan. Mannar Mathai Speaking 2 Is Releasing on 24th January 2014. Its a Malayalam Comedy Thriller Written and Directed By Mamas K. Chandran. Paappi Appacha and Cinema Company are The Earlier Films By Mamas. Vijayaraghavan (Ramji Rao), Biju Menon (Mahendra Varma), Devan (Urumees Thampan), Kunchan, Mamukkoya (Hamzakkoya), Janardhanan (Garvasees Aashan), Indrans (Ponnappan) etc are the other cast of this movie. Aparna Gopinath, Shammi Thilakan are The Additional Stars In Mannar Mathai Speaking 2. Asianet Bagged the Television Rights Of Mannar Mathai Speaking 2. Ramji Rao Speaking Is With Asianet and Mannar Mathai Speaking Is With Surya TV. The Story Of Ramji Rao Speaking and Mannar Mathai Speaking related With three people and a Drama Theater Urvashi Theaters. Mannar Mathai. Mukesh is Playing the role of Gopalakrishnan and Saikumar is Balakrishnan. Mannar Mathai Is an unsuccessful theater owner, He Is Running The Urvashi Theaters. In the first Part Rekha Played the Heroine and in The Second Part Vani Viswanath was Heroine. Rahul Raj is Composing the music and BGM for Mannar Mathai Speaking 2. Its Produced by Siby Thottupuram and Joby Mundamattom Under The Banner SJM Entertainment. Dear Mamas, Please Don’t Repeat This. Its a Request.